Here's Paul Scott, he was PD at CFCA and asked me to join their staff as a swing guy. Paul is one of the finest people I've had the pleasure of working with in this business. 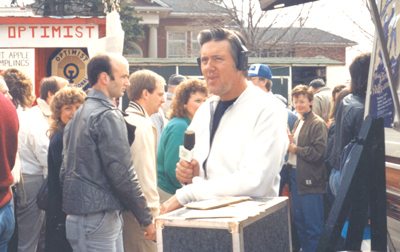 He left CFCA to head up the Broadcast Radio and Television course at Conestoga college. 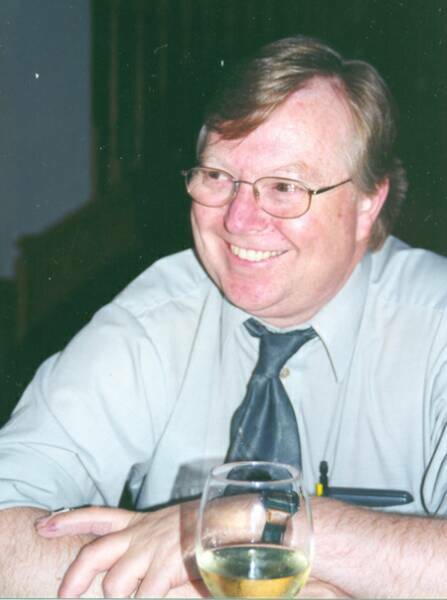 In 1994 after the sale of the radio division to CHUM Limited, he hired me as a radio technologist in the course and I spent 5 years at the college. I hired Paul for CKKW in 19?? 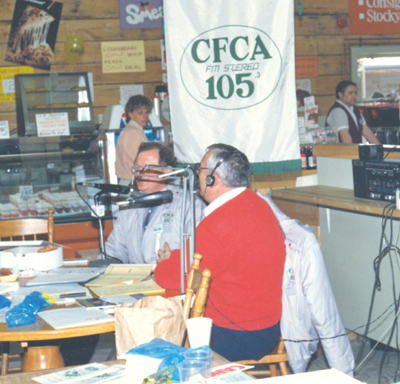 CFCA on location at the Waterloo Farmer's Market ~ Ken Sylvester on the other side of the mic. 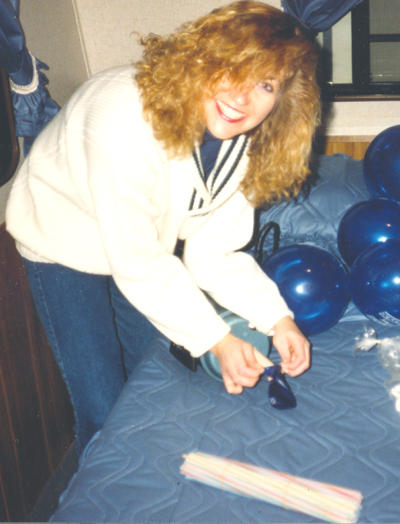 Wanda Love was the promotion director for CFCA in the late 90's ~ here she's blowing up balloons for our day long stay at the Elmira Maple Syrup Festival. 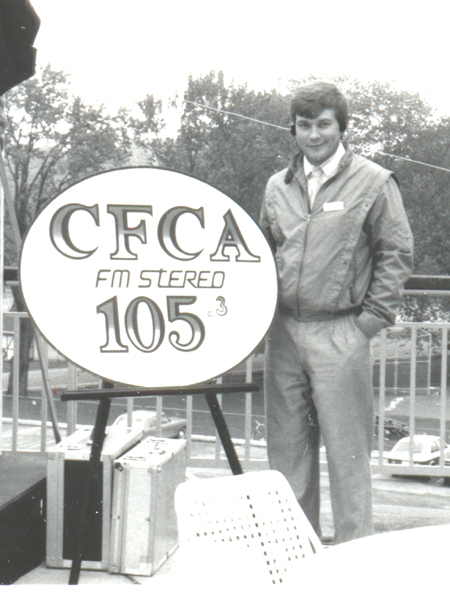 CFCA was on location at the Festival for many years, broadcasting live from a mobile home, and our crew of on-air types usually won the media pancake flipping' and racing event. 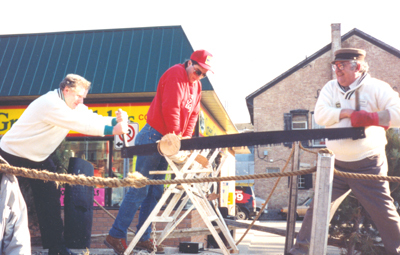 Here's a shot of two "over the hill" staffers entering the Double Bucksaw log cutting contest! 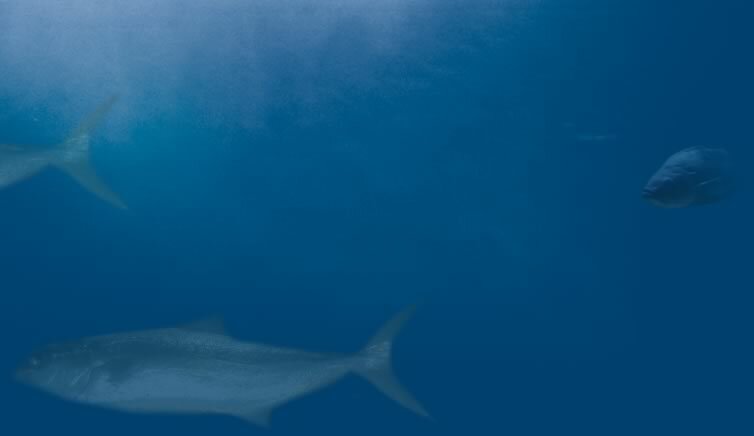 Ken Sylvester on the left and fatso Fisher on the right. I can't remember the time we registered in cutting the damn log, but there was a lot of smiles among the serious loggers in the competition. Giggling too! Fred Merritt working the crowd at the Syrup Festival. Fred was always a great draw as scores of housewives turned out to see their bestest radio friend! Happy days... here's John "Hoppy" Hodges , famous for his country radio shows on CKKW , regional talent searches, and "getting a well in a day, the Hadco way!!" 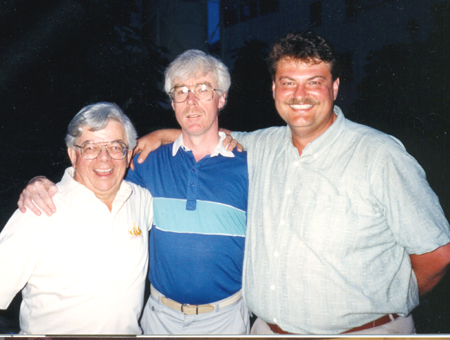 In the middle is Greg Shaugnessy, CKKW announcer and presently production director at CKWR. 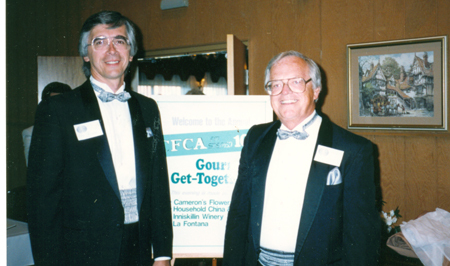 And last but not least, another good guy, John Yost, from the sales staff of CFCA. John is now the Sales Manager at Oldies 1090 and KOOL-FM. On the left, CFCA on location at the Farmers Market. 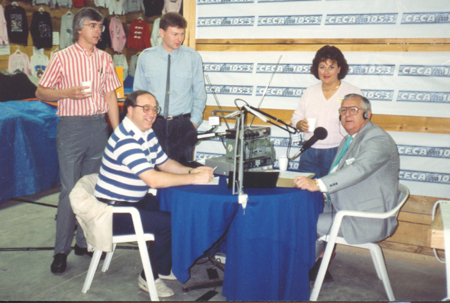 That's moi in the suit, Wayne Kooyman from the CFCA sports department, Phil Meighan far left, the operator Mark Heinemann,beside him, and an unknown lady beside me! 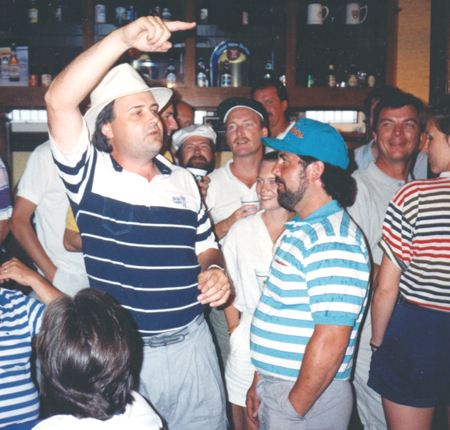 Here Phil Meighan and Bill Inkol CFCA Sports Director share the MC job at one of the Gourmet Get Together;s. Phil was still doing the morning show at this point and he and Bill used have a discussion and a bit of a rant every morning around sports time. It was a very popular feature of the morning show and the station thought it would be a bit of a blast for the two of them to share the MC duties ~ management was right, it was a blast! Witty, creative, and down right funny! A great time was had by all. Jeff Hutcheson was with the CFCA sports department and here he is directing traffic at a golf event sponsored by CFCA. He has gone on to be the delight of thousands on CTV's Canada AM, and along with the work he does on that show, he has an excellent travel show on CTV as well. Could it be that he's saying, "For those of you who have to go...the necessary room is thatta way!" "Follow me!" We can't forget the technical types in this montage. 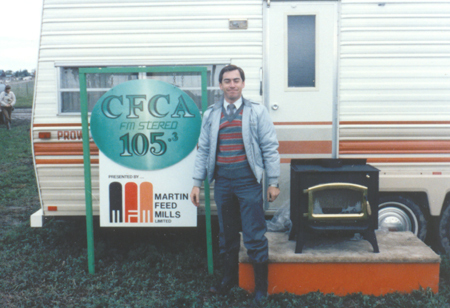 Here's a very young Erwin Nikel on location with CFCA. Likely he did the tech set up to get the show on the air. It would be his job to set up the set, or booth we would be broadcasting from, check the lines, set up the mic and the equipment, and monitor the whole thing during the broadcast. Below, we see a "cleaned up, dressed up" Erwin, after getting the remote ready from the Stratford Festival opening night. 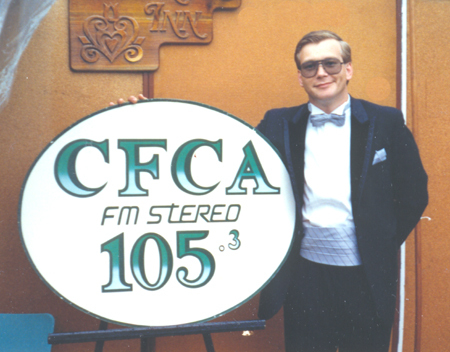 CFCA would broadcast from the opening night for several years, with interesting highlights of the season and many of the featured actors as guests during the show. Irwin is still doing radio production with the company. But now it's a CHUM operation, and Irwin works with rych mills [ another super guy ] in production with Oldies 1090, and KOOL-FM.